Family Martial Arts Centres currently have six full-time schools and multiple part-time satellite locations. Each full-time centre is over 4000 sq feet, fully equipped with a proper martial arts safety floor, lounge area, pro-shop retail area, changing rooms and Certified Instructor Training class rooms. All centres are run by fully qualified Chief Instructors, Assistant Instructors and Programme Directors. 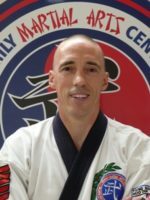 Family Martial Arts Centres are the ONLY Tang Soo Do Group to employ fully qualified full time instructors who have successfully completed the Certified Instructor Training Programme. Every year, each instructor spends 300 hours on teacher training, to ensure that our members receive the best possible tuition & mentoring experience. We have a child protection policy and our instructors are CRB checked and we are fully insured. We are also recognised by the Department of Education – Learning and Skills Council as a professional learning provider. In the past 12 months over 750 adults, children and families have joined our programmes. We are helping children from as young as 3 years old to adults in their 60’s and beyond, to learn martial art skills along with life and leadership skills by offering them a truly professional experience and fantastic training programme. We have programmes to help increase confidence, anti bullying, gang avoidance, stranger danger, weight loss and fitness, right through to becoming a Professional Martial Arts Instructor. We look forward to meeting with you very soon!